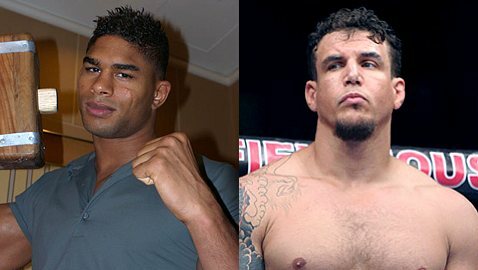 A heavyweight clash between former Strikeforce champion Alistair Overeem and former UFC champion Frank Mir has been added to the already stacked UFC 167 card on Nov. 16 at the MGM Grand in Las Vegas. The match-up was announced by the Las Vegas Review-Journal on Thursday evening. Both fighters come into the bout on losing streaks. Overeem has lost both of his fights since returning from a de facto nine-month drug suspension, while Mir, who replaced Overeem in the title fight after he was suspended, has now lost three in a row. UFC 167 will be headlined by a welterweight title fight between Georges St-Pierre and Johny Hendricks. Rashad Evans vs. Chael Sonnen, Rory MacDonald vs. Robbie Lawler and Josh Koscheck vs. Tyron Woodley rounds out the pay-per-view portion of the card. UFC 167 also servers as the UFC’s 20th Anniversary event.